One of the world’s top colonial hotels, locals and fans alike affectionately call this rose-pink palace ‘The Nelly’ or ‘The Pink Lady’. We admired it before even setting foot in it, but it was here, in the shadow of the majestic Table Mountain, that we came to join the ranks of thousands who have come to adore this Grande Dame. With nearly 120 years of history, hosting famous and influential people from Winston Churchill, to the Dalai Lama, it’s no real wonder why the Mount Nelson is known as Cape Town’s (and perhaps even South Africa’s) most famous luxury hotel. 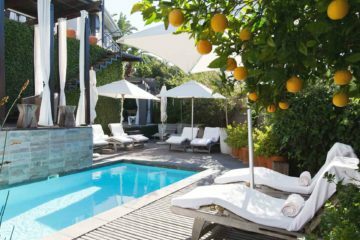 But despite more contemporary properties seeking to claim its title, the Mount Nelson continues to raise the bar – from its lavish high tea, to its unbeatable breakfast buffet, to its manicured gardens and pool, to its elegant suites. Expect a sense of old-world charm throughout – so if you want hipster, this is not the place for you. But if you care to step just outside the gates onto the trendy Kloof and Long Streets, you can mix the two to excellent effect. The highlight of our stay was the ever attentive and friendly staff, who on so many occasions went out of their way to make us feel at home from home.